The 4 Bay Array installed May of 2013. 8x7el. Each Bay has 2 antennas stacked at 1/2WL ~10' (to emulate the gain of a longer boom antenna ~13dbd). Bottom Bay starting at 1WL above ground (for high angle) then 1.5WL spacing (20, 50, 80, 110 feet to the center of each bay). The 4 bays are selectable in any combination to take advantage of different wave arrival angles. Total gain with all bays selected is about 19dbd at a 3.5 degree radiation angle. Tower is 160' 55G with K0XG rotating base and rings. The QTH with the two towers. 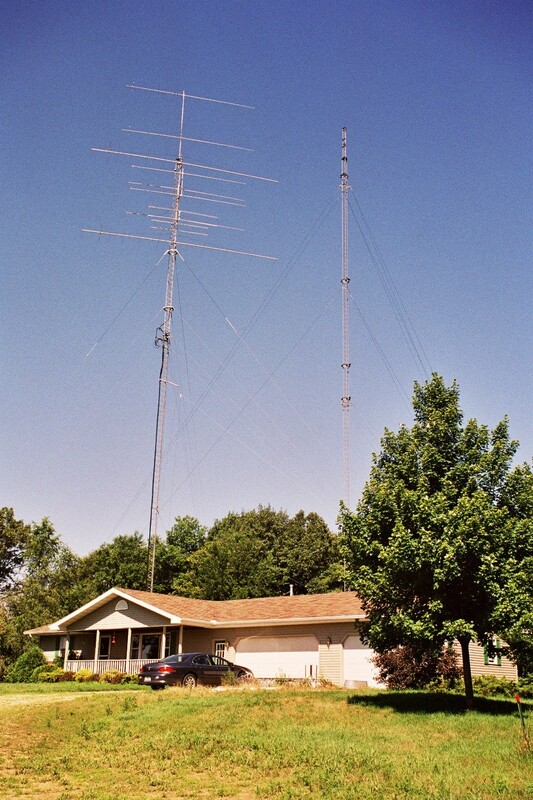 An older picture with the fixed Rohn 45 tower with ring rotors. The 160 foot rotating tower with new array is now in that same location. The two towers as of June 2014. Added some HF antennas primarily to operate from home as W1AW/9 for the ARRL Centennial QSO Party. Yes they really are both straight up .... its just the camera angle and lens that distorts the perspective. There is also a 4 el 10 a 35' and a 9el 2M at 25' (for short haul 600-900 mile Ms) hidden in the tree line along with the bottom bay of the 6M array. 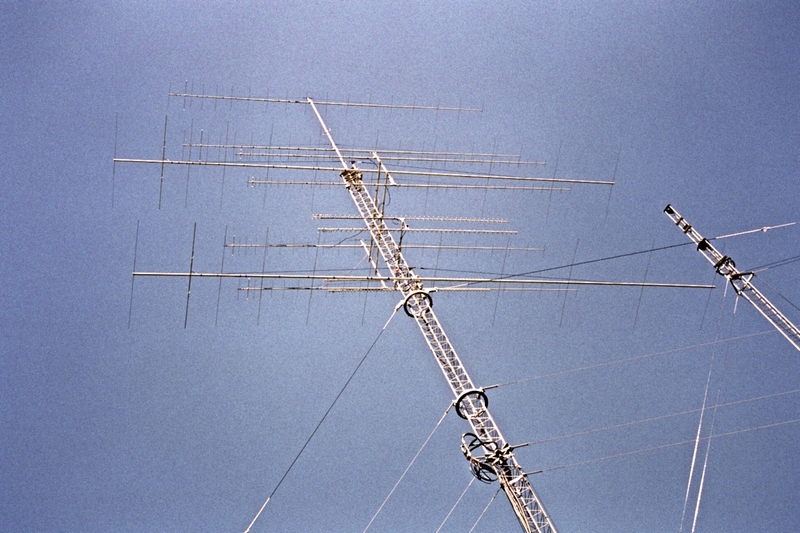 The VHF array 6M, 2M, 222,432, 902/3, 1296, 2304 and 3456 MHz. 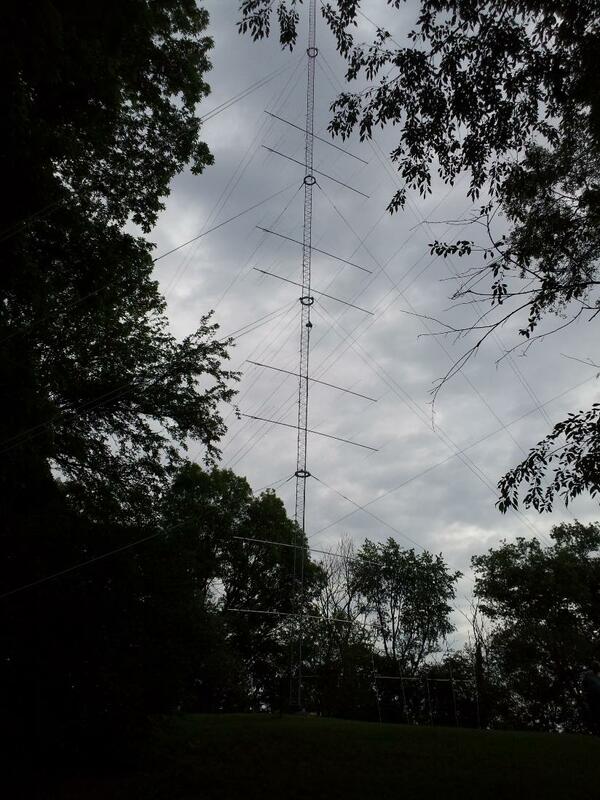 Tower is 50' of Rohn 45 rotating on top of 80' of Rohn 55 with K0XG hardware. 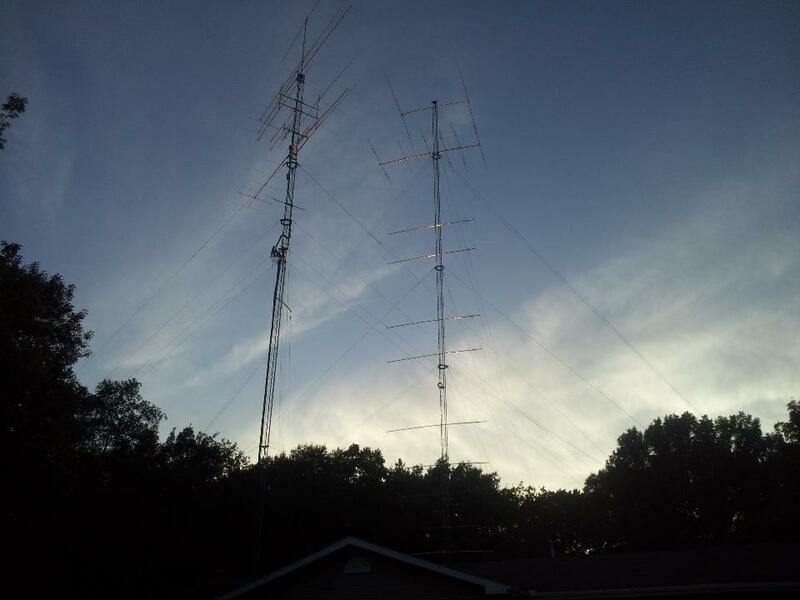 For perspective the 6M antennas have 50 foot booms and the 2M antennas on the top mast are 36 feet long. 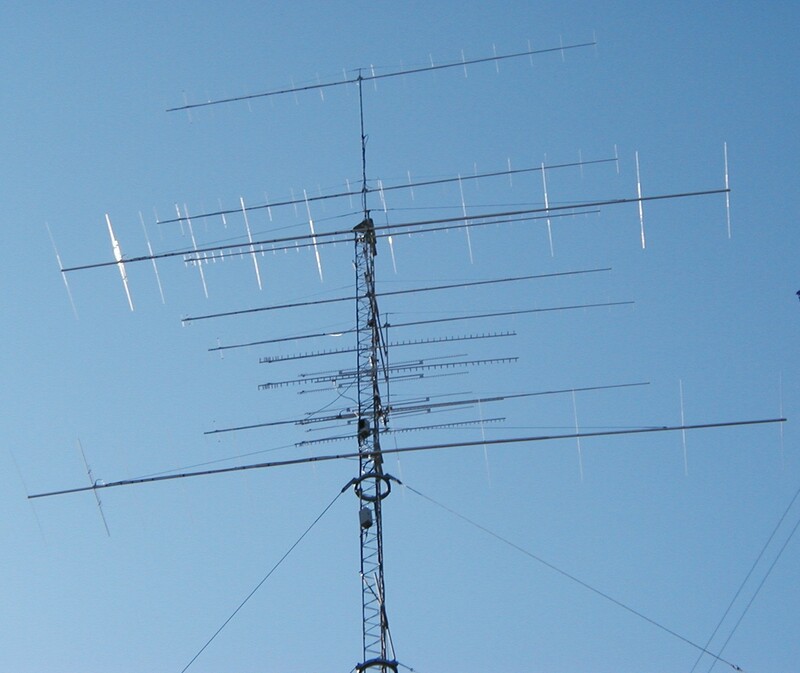 Top 2M antenna is at 154 feet. 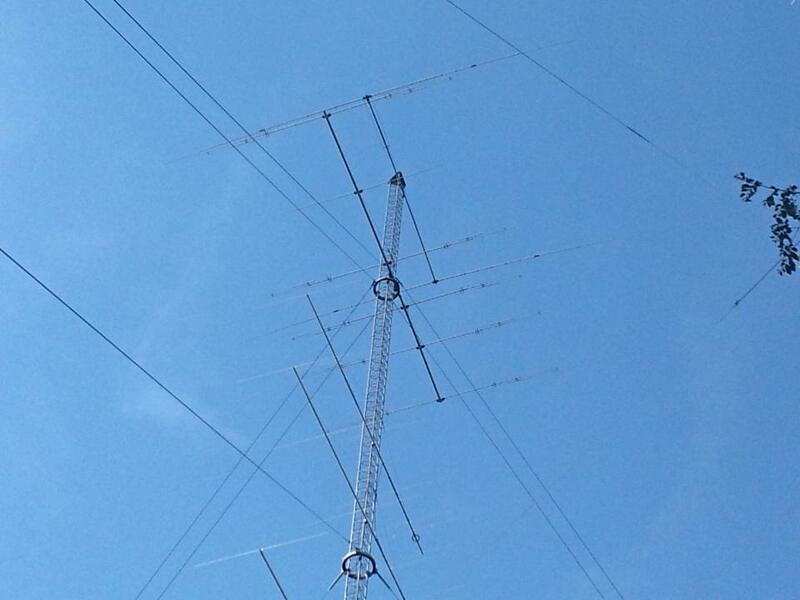 The top of the 160' rotating tower showing the top bay for the 6M array, the KLM KT-34XA tribander at 140' and HyGain Explorer 2el "Shorty 40" at the top.